Holey moley Vegan Ding Dongs! If you have a love for chocolate like I do you need to make these ASAP! Last week I made two batches of Vegan Ding Dongs and they turned out AMAZING! They’re fairly easy to make and I’ve included step by step pictures to show you how I did them! I thought making ding dongs would be more complicated, but really once you get it down you can have yourself some ready-to-eat Vegan Ding Dongs in only 2-3 hours! No offense-ies but these are even better than the original/real Ding Dongs because they don’t have any preservatives, artificial flavors, or additives. These are simply cream filled little chocolate cakes with a perfect layer of chocolate on the outside! Just talking about them makes me want to run in the kitchen and whip up another batch! I might! But for now let’s get to the goods so you can make your own Vegan Ding Dongs as well! 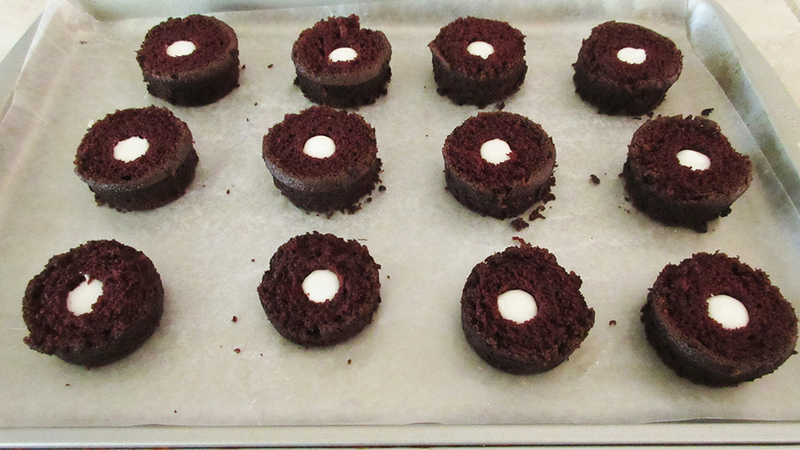 For the supplies I used this Wilton 12-cavity Spool Cake Pan to make the little cakes (you might want two). This Wilton Treat Corer, to core them of course. A Wilton piping bag and tip. This nifty Dipping Scoop. As well as these Wilton Scoop-It Batter Spoons which I LOVE because they’ve made my job so much easier! When I used to make doughnuts I would spoon in the batter with a regular sized spoon or pipe it in with a piping bag, both methods were more tedious. My mom found these and they’re the perfect sized scoop for cupcakes, the ding dong/spool cake pan we’re using today, and the Wilton doughnut pans! I highly recommend! Now, on to the recipe! Add all dry ingredients to a medium bowl, mixing well. Then add all wet ingredients (aside from white vinegar) into the dry ingredients bowl, mixing well to combine, removing all lumps. Last add the white vinegar and mix well. Grease your pans with coconut oil and spoon the batter into the pans. For the spool cake pans, place 1-2 pans on the middle rack of the oven for 20 minutes. For 9” round pans, place on the middle rack of the oven for 30-35 minutes. This cake recipe in any pan is done when an inserted toothpick comes out clean. Let cool completely at room temperature or in the fridge before coring. I don’t usually measure out ingredients for frosting or icings, I usually aim for a consistency by starting off with a little of everything and working from there. So, in a medium bowl add about a cup or two of powdered sugar. Add just a little coconut milk, about a teaspoon, and add a teaspoon of vanilla extract. Blend with an electric beater or a whisk until smooth. From here add more powdered sugar if you want your filling to be thicker or more coconut milk if you want it to be thinner. I went for a medium thickness, not super thin so that it would soak into the cake but not so thick that it was difficult to pipe. If you don’t have coconut milk you can use any plant based milk or even water. Another alternative would be to use canned coconut milk, refrigerated or not. If you used refrigerated coconut milk like in my Buttercream Recipe it will end up more like a buttercream consistency. So it’s up to you! I was out of coconut milk and I didn’t want to crack open a can of coconut milk so I just used water and it was still amazing! Set up some kind of double boiler. As usual I’m using a little metal bowl over a little metal pot. The bowl doesn't fit in it all the way or touch the bottom. Fill the pot with about ¼ cup to ½ cup of water. Put your bowl or double boiler on top and add your chocolate chips, cooking over low heat, stirring occasionally. Once melted add your olive oil, about a tablespoon at a time to thin out the chocolate. You want your chocolate to be fairly thin so that it covers your ding dongs nicely. I’d aim closer to the 6 tbsp, but it’s up to you as well! Dip then refrigerate your ding dongs until the chocolate hardens up. Then enjoy! Before I made and photographed this batch I made a previous batch where I tested out different thicknesses of the chocolate. I did a few without adding oil and they were as one would imagine very thick. After adding about 2 tbsp of oil I dipped a few more. Better, but still thick. I added more oil and dipped more, I continued to do so until I reached the consistency I liked. For myself I like a medium-thin layer of chocolate so I personally would stick with about 6 tbsp, maybe 7. However you can keep adding more oil until you’re satisfied. Now! On to the picture-filled step by step process! Once the batter is finished and the oven is preheated grease your pan(s) with coconut oil. Here is one of the Wilton Scoops I was talking about. They're finished baking and, once cool, I cut the tops off with a knife. Time to fill them up with the filling. Use the excess tops and left over filling to make whoopie pies! SO good! 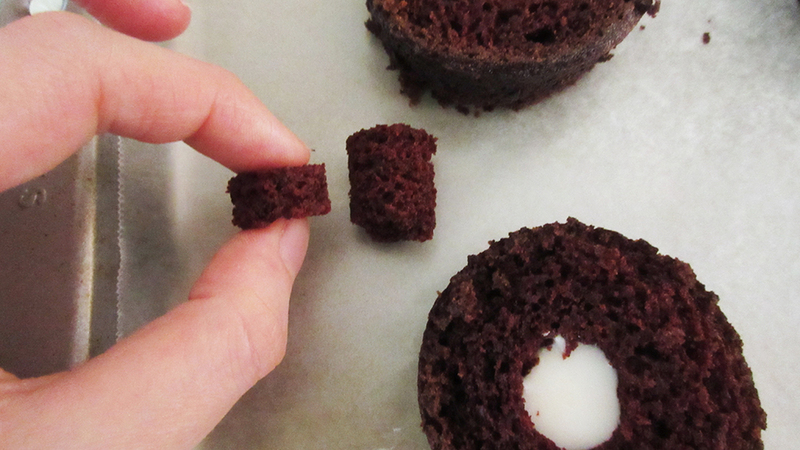 I like to tear the cores in half and put them back in to make dipping in chocolate easier. At this point I'm still adding oil to the chocolate to get the right consistency. Perfect consistency, time for dipping! This one did, but if the ding dong doesn't fit all the way into the chocolate simply scoop the chocolate on top with a spoon when you're getting low on chocolate. Once it's dipped and covered tap your spoon on the edge of the pot to knock off any extra. I did this for about half of them and it's more uniform to knock off the extra. Seriously! I might need to make another batch just because! These were super fun to make and even more fun to eat! I hope you enjoyed this chocolate covered post! Are you more of a chocolate person or a...I don't know what a non-chocolate person is, a vanilla person? I'd love to hear! Have a great weekend everyone!